Best Natural Sweetener for Raw Food - Good Old Fashioned Dates! Home Guest Editorials The Best Natural Sweetener for Raw Food … Good Old Fashioned Dates! The Best Natural Sweetener for Raw Food … Good Old Fashioned Dates! In this guest editorial, Matt shares what why dates are his favorite sweetener. So many sweeteners have popped up over the many years since I’ve been in the Raw Foods movement. These sweeteners include agave, coconut sugar, Jerusalem Artichoke syrup and the list goes on. While these may be great healthy sweeteners and good alternatives to refined sugars, I have found that the best natural sweetener to use in my raw food recipes are good old-fasioned dates. It’s simply a whole food and I just blend them in my recipes. Even my raw barbecue sauce! Dates are rich in rich in vitamins and minerals, improve triglycerides, fight free radicals and improve the appearance of skin and hair! Six reasons to incorporate dates into your daily diet! Vitamins: Dried dates contain Vitamin A, Vitamin C, Vitamin E, Vitamin K, Vitamin B6, Thiamin, Niacin and Riboflavin. Minerals: If you struggle with hemoglobin deficiency or anemia, dates contain a high iron content that can resolve these issues. Dates are also rich in calcium, magnesium, phosphorus, potassium, copper, manganese and selenium. Constipation: If you have irregular bowel movements, dates are a great source of dietary fiber that will serve as a mild laxative. Strengthen Muscles: Dates have been found to help strengthen heart muscles. It is advised the pregnant women eat dates to strengthen uterine muscles and make delivery easier. 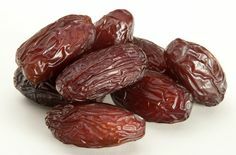 Many body builders consume dates prior to a workout to improve energy. Stamina: Dates improve physical stamina as well as libido due the amount of minerals and phytonutrients they provide to the body. Study finds that eating large amounts of dates had no adverse effects on blood sugar levels or weight but did improve triglycerides and antioxidant stress levels! Regular consumption of dates can result in healthy, glowing skin and hair! Dates are a great alternative for sweetener and are a great addition to your favorite recipes or will even sweeten a smoothie. (2) If you make your own granola bars or energy bars, consider adding dates in to help make them sweet and chewy. If you have a sweet tooth, dates are an excellent and healthy way to satisfy a craving! Wonderful article thanks for Posting! Dates are great for raw smoothies as well.